Refresh, relax and re-energise with our on-site massage services and wellbeing events provided across UK. 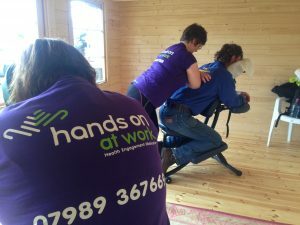 We run 4 adult riding camps a year and thought it would be a nice treat for our participants to have a massage at the end of a long day. An opportunity for a little time for themselves. The massage is a highlight of camp. The therapists are always professional and friendly. Workplace Massage and Wellbeing Events. Working across the UK to help you improve staff health and wellbeing, engagement and motivation.